Mashable has a post about the fact that 60% of Twitter users quit within the first month. They’re getting their info from this Nielson report. 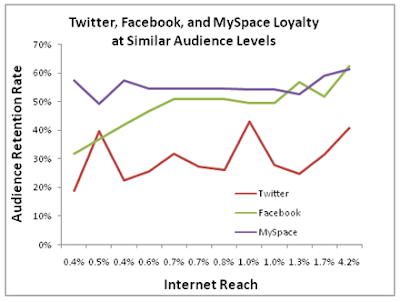 A key fact that Mashable pointed out is that this study ONLY measures Twitter.com users. Many, many users don’t go to twitter.com anymore. They use downloadable applications that use scripts to access the site. Tweetdeck is an example. It’s not surprising. I’ve seen a lot of people who just don’t “get” Twitter. Why would I write updates all day? No one cares that I’m brushing my teeth right now! I don’t care what you’re watching on TV! Getting links to blog posts from people whose opinion you care about. Finding out what other people are interested in. I barely even check news websites anymore. If anything is really important, I can usually find about 10 links to the story in my Twitter feed. This takes time, however, because you have to follow people who will actually post links to stuff you care about, and not links to boring stuff that you have no interest in. It takes time and trimming, but once it’s done, it’s pretty sweet. The more people you know who join Twitter, the better. But if the bubble explodes before people experience Twitter’s potential, well, we’ll have to wait for something else to come along.